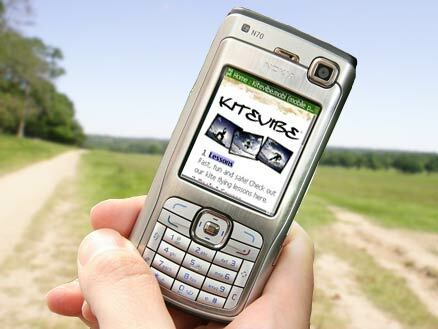 Since we spend a fair bit of our time outdoors we are pleased to announce the release of the kitevibe web site in a new mobile phone friendly format: kitevibe.mobi. Kitevibe.mobi will give you access all the same information, photos, galleries, etc. as before but now with new up-to-the-minute weather sites, internet map sites, GPS travel data and more besides. Assuming that both your phone and current tariff allow you to access the internet, select your phone's internet browser. Choose the "Goto URL" command (or equivalent). Enter "kitevibe.mobi" and then select "ok". We've tested kitevibe.mobi as many phones as we can and found that it works fine on a wide range of GPRS, 3G and Wi-Fi enabled handsets. That said , it should come as no surprise that Kitevibe.mobi might appear differently if you try to display it on older handsets (i.e. those with mono coloured screens). As of 10.03.07 our kitevibe.mobi site has been inducted into the dotMobi showcase for mobile phone web page design. Many thanks to all those who helped get the site together.